While the summer weather continues in southern Alberta, the hockey season will be kicking off at the Taber Ice Arena this weekend. As per usual tradition, the Lethbridge Hurricanes and the Medicine Hat Tigers will be suiting up for a pre-season match-up. Last meet up in Taber saw the Tigers cruise out of Taber with a 5-3 victory in a high-scoring affair. The 2017-18 season saw both teams once again at the top of the WHL Central Division and found themselves again in the playoffs. The Hurricanes, while they did make the playoffs, struggled out of the gate and only finished the season with 72 points which was good for second in the division. After a massive trade that saw captain Giorgio Estephan, Tanner Nagel and Canes former 1st round draft pick Stuart Skinner traded to the Swift Current Broncos for Logan Barlage, Logan Flodell, Owen Blocker and Matthew Stanley, the Canes came alive. Heading into the playoffs, Lethbridge showed why they deserved to be a contender in the WHL playoffs after they quickly disposed the Red Deer Rebels in five games before meeting up with the Brandon Wheat Kings in the second round. 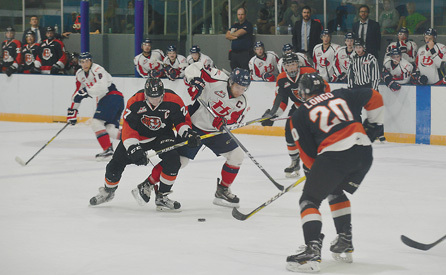 Once again the Hurricanes quickly vanquished their opponent in five games before meeting up with the Swift Current Broncos in the Eastern Final. While the storybook playoffs continued for the Canes through the first two rounds, it came to an end as Swift Current was too much to handle and won the series in six and eventually found themselves in the Memorial Cup after winning the Ed Chynoweth Cup. Medicine Hat, on the other hand, was the most dominant team in the Central Division as they racked up 36 wins and 80 points in the main campaign. The team struggled in the playoffs and couldn’t get out of the first round though as the Brandon Wheat Kings which denied the rematch of the 2017 playoff series between the Canes and Tigers. The offseason also provided both teams with positives moving forward. Hurricane players were noticed during the NHL offseason as captain Jordy Bellerive signed a deal with the Pittsburgh Penguins, Brandon Morrison signed an entry-level deal with the Los Angeles Kings and Brennan Mennell signed with the Minnesota Wild. Meanwhile, at the NHL draft, Calen Addison was selected 53rd overall in the second round and will join Bellerive in Pittsburgh further down the road. Looking ahead, Lethbridge forward Dylan Cozens, WHL Rookie of the Year for 2017-18, is projecting to be a top draft pick in this year’s NHL draft and will be a major player on the front end for this year’s Canes team. The Tigers saw David Quenneville, the leading scorer for defenceman in the WHL for the 2017-18 season, sign his three year entry-level deal with the New York Islanders. For the upcoming season, the Tigers will once again be leaning on some of their younger players including Josh Williams who put up 20 points in 40 games in his rookie year. The two teams will meet in two preseason games before once again kicking off the regular season with a home and home split. The first WHL regular season game for the two squads goes in Lethbridge on September 21 in Lethbridge at 7 p.m. and will be followed up with a trip to Medicine Hat for game two the next night at 7:30 p.m.
Before that happens though, they will line up in Taber this Saturday with puck drop at 7:30 p.m.
Tickets are $10 and will be available at the door or you can contact tmhatickets@gmail.com.